WHAT YOU’LL FIND HERE: Skateboards, trucks and wheels are our main hard goods. The shop always has on hand those little things you need to keep you rolling such as pivot cups, risers, kingpins, bearings and even DVD’s for those rainy monsoon days in the desert. Soft goods, we support a lot of fellow local skaters who make their own shirts and a former local skate shop owner Terry McChesney who wrote a book about El Paso skating. We carry his shirts and book as well. We also carry shirts that some of our riders have started to make. Charles Webster has BumTown clothing and his shirts are great! Alex Marin has Native Skateboarding shirts in our shop as well. WHAT GOT YOU INTO SKATEBOARDING? I saw a skateboard at K-Mart actually when I was about 10- years-old and right then and there I knew I wanted to just skate! Once I progressed my uncle bought me my first pro complete from Terry McChesney at Skate City. I got a Hosoi with Venture trucks and Hosoi Rockets. BIGGEST CHALLENGE ABOUT RUNNING A SKATE SHOP? Having the variety that all the local skaters want can be a huge challenge. There are so many different styles and preferences it can be difficult to keep up with them all. We try our best by listening and talking to our customers wants and needs. There is also the competition of the mall stores that carry a lot more inventory such as clothes and shoes and their prices are sometimes hard to beat but usually we can match them. 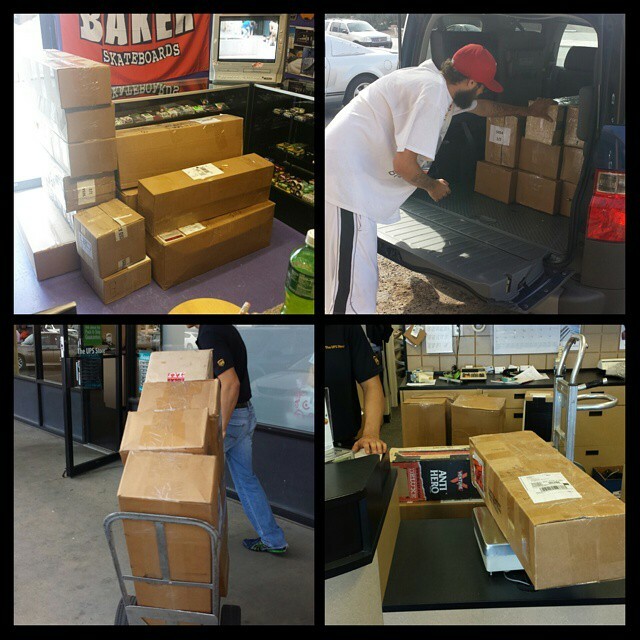 We are big on supporting local and staying out of the malls. BEST SELLING HARDGOOD IN YOUR SHOP RIGHT NOW? We sell a lot of Toy Machine, Deathwish, Baker, Girl and Mini-Logo decks. Independent trucks are the most sold trucks at our shop. Bones STF wheels sell pretty quickly as well. HOTTEST SOFTGOOD? 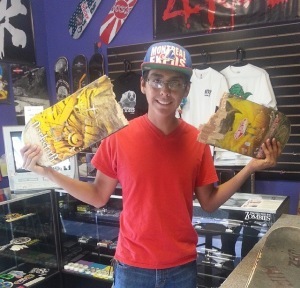 We sell a lot of the Choplife shirts which are made by a local skater from El Paso who also does grip. His name is Josh Tello and his stuff is just blowing up! Be on the look out for him! YOUR THOUGHTS ON SKATEBOARDING TODAY? A lot of kids have an entitlement persona when it comes to the shop they ride for or the deck they have or the fact they can do a certain trick and another kid can’t. Skateboarding is supposed to be fun and enjoyed. The best thing is that it’s a unique sport like no other! You can always challenge yourself and your buddies to reach that goal to land that one trick you have been trying for days to get. There is always room to improve and come up with your own style and your way of doing a trick, and no one skater is like the other. It brings out somebody’s personality. It’s a sport and an art form at the same time. MOST UNIQUE PRODUCT? We carry grip designs by local skaters one is Ratt Pack by Chris Melero and also our friend Josh Tello who makes Choplife grip and it is sick!! We can’t keep up with the demand it flies off the shelf quick! HOW DID YOU HEAR ABOUT IRIR? My wife actually found out about it on Instagram. We follow Mike Vallely and saw a post about IRIR and she knew instantly our shop had to be a part of it. We had the pleasure of meeting him shortly after finding out about IRIR at a show Black Flag was playing here. We were able to talk to him for awhile about IRIR and how we were planning on being a part of it. HOW MUCH BROKEN WOOD GETS ACCUMULATED EACH MONTH? I would have to say about 100 or more decks. Hard to keep count. WHAT ARE YOUR THOUGHTS ON IRIR AND WHAT IS DOES FOR SKATEBOARDING AND THE ENVIRONMENT? We love it! It is such an amazing cause and are proud to be part of the solution with IRIR and Art of Board. My wife would say what a waste it was to just throw away some usable boards and never even knew the impact it had on the environment until we read about it on your website. The response we have gotten from our community has been great, too. We spread the word as much as possible when we are at the parks out skating and to every customer that comes into our shop. The fact that IRIR also helps less privileged kids out there to get a board and our shop is part of that makes our day. ANYTHING YOU’D LIKE TO PROMOTE? RIDERS? VIDEO? EVENTS? Sk8 Lab Board Shop has an amazing krew! We have guys and girls on our team that have such talent and are progressing every day. We have a wide variety of skaters from intermediate to advanced and one in particular, Jacob Whitt. He is a freestyle genius and reminds us of Rodney Mullen, He’s actually won several competitions. There are some on the team that mostly street skate and some that are more likely to be found in the parks. They support the shop and represent the shop so well and we are proud to have them. 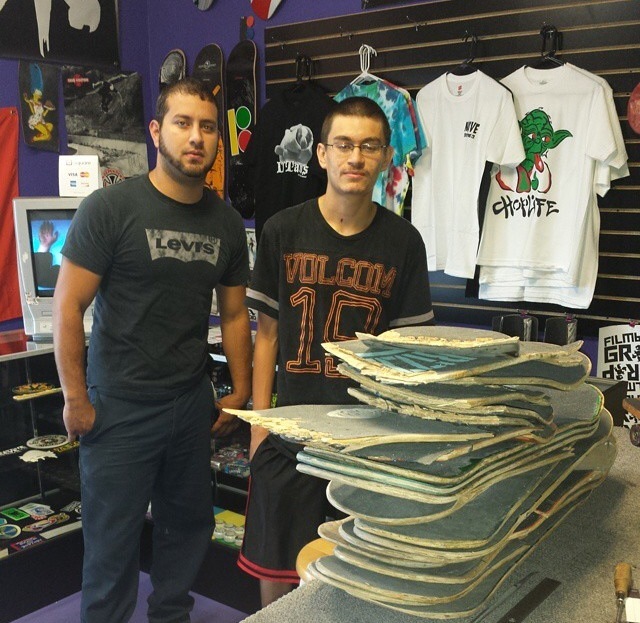 Sk8 Lab crew shown here packing up boxes of broken and used skate equipment to donate to I Ride I Recycle.